Taken from the 11th floor of the l'Europa apartment building (guess which lucky person went there for lunch today?) There's something to be said for delivering dog food and being asked to stay for lunch... 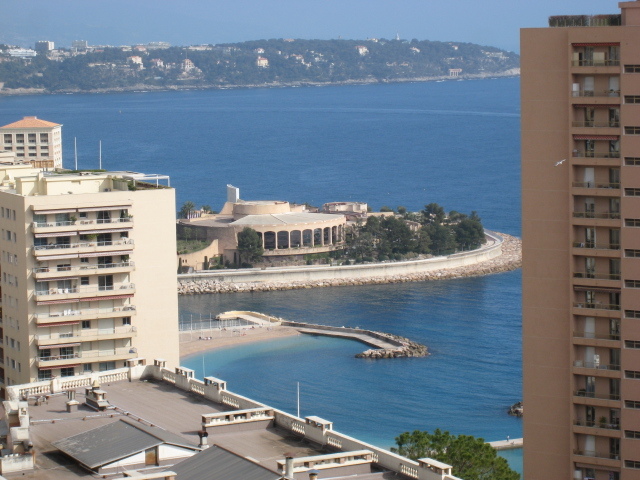 The curved building you see jutting out to sea is what's known as the Summer Sporting or Jimmyz which is the famous nightclub of Monte Carlo. The Summer Sporting used to be where the Outdoor Summer cinema took place and where you sat in easy chairs under the stars, sipped a glass of vino and watched the latest film in English. The films started at 10 p.m. Now tho, the outdoor cinema has been moved to the Rock, or Monaco Ville where the palace is. In the distance you see the penisula of Cap Martin and the other side of that is Menton (see my other DP blog) and beyond that Italy. End of geography lesson! There's so much noise from traffic in the Summer I often wonder how anyone manages to hear the film. It looks like Summer in the photo. So you're the Dog Lady of Monaco, eh?! Great gig!